I'm outraged. I saw an article today about how Lindsay Lohan will only serve about 15 days of her 90 day sentence...because her lawyer managed to pay off the right people. What a rip-off. Celebrities also get private cells and in some cases, special foods so they can stay on their diets and not gain weight. They also are not subjected to strip or body cavity searches (in most cases) like other prisoners after being booked. So, what's going to keep her from doing it again? Did she really learn anything important about her crime, that is, other than she can get away with it? Perhaps if she was treated like the other prisoners and NOT given special handling, she would actually benefit from her incarceration. More importantly, what does that show our children when celebrities can get away with crimes? I personally believe that jails and prisons should give inmates LESS rights and privileges than they currently do. Prison should not be FUN or COMFORTABLE at all. 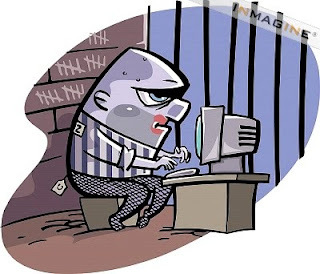 It irks me that taxpayers foot the bills for TVs, computers, and other technology for our prisoners. They should lose those rights when they are behind bars. Prisons should provide only clean but stark rooms, healthy outdoor activity and nutritious food for their inmates. Perhaps as a priviledge, they could visit a library and check out books, but that's all. No TV, no radio, no computers and no phones. Am I being too harsh? I don't think so. What do you think? 100% AGREE with you... she probably won't learn a darn thing from this whole ordeal.. Some people just never learn. Simply disgusting. I thought justice was supposed to be blind...I guess that only applies to being unable to see someone that needs to be sent a message for their destructive lifestyle...sheesh! I've always thought prisons should be dank, miserable dungeons where prisoners are forced to grow their own food if the want to eat and that's all the entertainment they get as they serve every single day they are sentenced to. No parole, time off for good behavior, cable TV....In other words and experience so miserable they never want to go back. Prison is punishment for breaking the laws of the land. Anita Renfroe "Don't Breathe" - Hilarious!